24 online courses, essential webinars, and digital resource kits including ALL of my popular classes! PDF’s sent to your inbox to download right away. Work through the materials at your own pace. 16 NCBTMB Approved Massage CE’s available. Learn the tools of successful wellness entrepreneurs and grow your massage or skincare business today! Boot Camp will give you the tools to market your business, book yourself solid, and grow your business! Are you just starting out in your business? Maybe some of your regulars have dropped off? It happens. Are you tired of working SO HARD, and just barely getting by? Building a clientele can be difficult, especially if you are on a budget. Sometimes it’s hard to figure out what to do next…. Let’s do this together! And get your ideal clients on the table or in the chair, and on a regular schedule. Rebooking and building your clientele with repeat clients and raving FANS! Before taking this course, I was failing. My business was barely keeping me above water. I was constantly stressed about how I was going to pay the next bill. Since taking the Marketing and Mindset Bootcamp (part of the Thriving Therapist Mastermind), my business has grown! My website is maintaining new, unique visitors weekly. My weekly client base has DOUBLED! This group has continually helped to challenge me and changed my thinking with marketing myself. Gael is an AMAZING leader! She demands a lot of her students. She keeps a really good pace in the teachings. She is so open and willing to share her experience and knowledge. She opens doors in your mind and gives confidence and ideas to grow yourself. Not only as a person, but also as a business owner! Even though bootcamp is completed, I am still growing! I love her Facebook group. Everyone in the group is open and willing to help with questions and “road blocks”. I have found so much value in this bootcamp. It is definately worth the investment of your time and money. You WILL grow. You WILL be better. Your BUSINESS will explode!!! Thank you so much Gael for helping me save my business. I am going to be doing a CE class at the end of June, over how to start your massage practice. Last year, I took your 30 day marketing boot camp (part of the Thriving Therapist Mastermind), and I will be telling people about it, since it was instrumental in my development as a Private Business owner. This class is just barely touching the basics with how to start a business, but not getting in depth the way your boot camp did. I also want to thank you for what you have done, videos, challenges and all that jazz. It really helped me. Last year I did the Marketing Bootcamp and it took me almost 4 months to complete it. My 5 year goal was to quit my job and be fully independent. I hit my 5 year goal this next week. My last day working for someone else is next Wednesday and I will be fully independent and a business owner. You were one of the sparks that lit the fire, and I couldn’t be more grateful! I just want to say “Thank you” again! This bootcamp has changed my business. I am busier now that I have been in a really long time. I am still behind (financially) and broke, but I am getting caught back up! It is GREAT to be able to pay the bills AND have the money to invest back into my business. Or allow the kiddo to grab something she wants at the store. Thank you so much!! Earn $10,000 MORE in 2018! Are you ready to have the career you wanted when you started your massage journey? What if you could add $10,000 to your income in the next year? I know that isn’t exactly millionaire’s row, but it sure could make life easier, less stress-full and more fun! Are you ready to get started on your massage business? What’s included in the Massage Business Start Up Intensive? 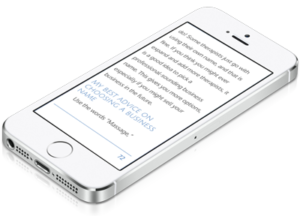 Plus the companion ebook, Massage Business Start-Up Guide, updated for 2017 and formatted for easy reading on mobile devices. Turn your massage business into a full Day Spa with the 6 Week Spa Masterclass! It’s no secret that massage therapy is hard work! Even the best therapists can become injured, or burned out. Learning new skills will bring in more money and extend your career. Are you ready for a change? In the USA alone people spend $14 billion dollars a year on spa services with an average “ticket” price of $137. Are you leaving money on the table? We will cover all that and more in the Six Week Spa Masterclass! Easy Natural no-shower Body Wraps using aloe, herbs, and essential oils. Skin Smoothing Body Scrubs, and no mess exfoliation with a body brush or loofah. In addition to the videos you will receive a printable step by step workbook with photos for each service. Workbooks includes a supply checklist, complete service protocol and a one page “cheat sheet” you can use in the treatment room for reference. Are you struggling to build up your massage practice? Do you wish clients would rebook effortlessly without an awkward conversation that leaves you feeling “salesy”? If the answer to any of these is yes, then this class is for you! When I started out as a massage therapist 20 years ago I didn’t know what to say to get my clients re-booking and referring. I just couldn’t figure out why my clients weren’t rescheduling, even though everyone said my massages were excellent. I had to figure it out, or get a new job! I’ve spent many years and thousands of dollars learning business building strategies. Now it’s my turn to help you build the business that’s just right for you. Did you know the most common reason massage clients don’t come back to a massage therapist have nothing to do with the massage? It’s true! Usually it’s small details that were overlooked or they were simply not invited back. Don’t let your clients leave unhappy or wondering what they should do. Rebook massage clients and get a constant stream of referrals like a pro! This class is for Massage Therapists that want to add a FUN new service to their businesses, teach group classes, and share the benefits of massage in a new and exciting way! Class handouts on: What we will learn, Creating a relaxing massage environment, Basic massage techniques, Benefits of massage, and Massage contraindications. If you have been wanting to add a unique new service to your business, another income stream and save your hands, this is it! Being a new parent is STRESSFUL and infant massage is a great way to sooth a fussy baby, play with baby, and develop a loving bonding routine. How to find and approach groups in your community to teach infant massage, boost your expert status and help new families! How to offer infant massage in your office to new parents. An overview of an infant massage class with full routine, and hand outs that you can use to teach your class. Demo video of infant massage on a doll! 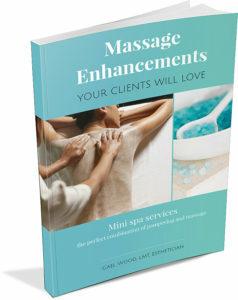 Spa Enhancements are a wonderful way to add value for your massage clients, save your hands, and boost your bottom line! These additions to your already terrific massages will be a perfect combination of relaxation, therapy, and pampering. You don’t have to be an expert in spa services to add these money making services to your menu. Just follow the step-by-step instructions in Spa Enhancements Your Clients Will Love! These are the services I have used in my 20 years as a Massage Therapist, Esthetician, and Spa Owner. I’ve trained dozens of therapists just like you. PLUS 6 NCBTMB Approved Massage Continuing Education Credits – upload your practice sheets online to earn your certificate for 6 NCBTMB approved CE’s! How to purchase a domain name, set up your home page, additional pages, and a blog. How to link to online appointment booking and newsletter set up. The basic information that your potential clients are looking for to help them decide where to go for a massage. You’ve been at this awhile, and you are ready for the next step in your massage therapy career because you have knowledge and gifts to share…. BUT you just aren’t quite sure exactly how to get started with teaching massage continuing education classes. Our profession NEEDS good CE classes, how many times have you sat through a class or online recording bored, uninspired and knowing that you can do better? The applications (NCBTMB) can be intimidating and a little confusing, you might be wondering what exactly you should teach, and how to organize it all….not to mention every state has their own regulations! You are ready, that’s why you are here. We just need to sort out the details! You don’t have to figure it all out on your own. I’m running a 6 week intensive help you get started with teaching! Meeting the application requirements and getting it filled out and sent in! What exactly you should teach, and generating ideas. Submitting your classes for NCBTMB approval in detail including your learning objectives, and learning outcomes. Teaching basics, organizing your content (lesson plans) and making your classes fun. Creating Certificates and keeping your records organized, as required by the NCBTMB. Marketing and filling your classes for maximum profits and impact! PLUS anything else that comes up and needs to be sorted! I do not like to follow the rules, and I do not like jumping through hoops and being “regulated” BUT I do love teaching massage therapists, traveling and making great money. You will too! Are you ready to make more money, and launch a new and exciting career? CE providers are needed in almost every state, and you can even run fun and lucrative retreats! Get ready to launch the next step in your massage career. Create recurring income, a full schedule, and clients that are your biggest fans with membership programs! Have you been thinking about starting a membership program, but you just aren’t sure where to start? Memberships can create a steady income for you and your business and your clients will get better results too, because they will be on a regular schedule, leading to more referrals and more new members! Join us and learn how to create a profitable membership program that’s a WIN for you and your clients. Membership are NOT about discounting. Discounting often comes from a place of fear or even desperation….. This workshop is about creating a business model that supports you with a great income and supports your clients with the benefits of regular wellness services. You will get the tools you need to design, name, price and become confident at selling your memberships. Your clients will get better results and feel like VIP’s! We will cover in detail pricing, member benefits, payments, naming your program, membership levels, cancellation policies, terms and conditions and much more. You will be ready to plan your program and launch it ASAP! Are you using Instagram for marketing your business? Instagram is a great place for small business owners to connect with local ideal clients, and it’s FUN! In this webinar, we look at the benefits of marketing on Instagram, how it differs from marketing on Facebook, and how to get started with screenshare videos to make it all the easier! Chair massage is a big money maker and a low overhead fun business to run. Rebooking is the key to your thriving massage practice! 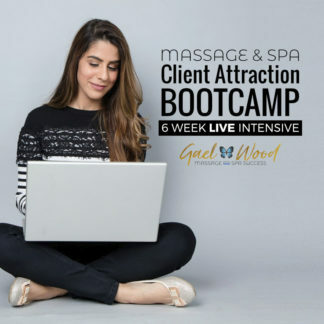 How would you like to attract your ideal dream clients that you love working with, that value you and value what you do? Of course you would! Clients that aren’t the right clients for us are draining, they ask for discounts, don’t show up, and we really don’t enjoy working with them. Am I right? Sell your services and stay booked! Events are a great way to create a buzz about your business, get new clients in the door, increase your gift certificate sales, build your business with rebooking your gift certificate clients, showcase your business and have fun! This workshop was created for Mother’s Day events, but can be easily modified for any event you can imagine! This is a replay workshop that you can watch anytime. If you are looking for a fun and unique way to promote your business, then you must join this workshop. Stand out in your community and provide a healthy gift option for mother’s day! Do you need an opt it? YES! Email marketing is affordable: you collect an email address once and can keep sending information and offers. People take more action from emails than social media. People consider email from brands they signed up with to be useful and informative. Learn what you need to do to create a high value opt in offer and build your mailing list! Printed marketing materials are an affordable way to reach your ideal clients. Only a fraction of your potential clients are looking for massage online. Did you know that 82% of Americans have never had a professional massage? 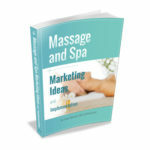 Your professional marketing materials will give them the idea, and let them know how massage can help. Download your pdf’s right away and work through them at your own pace. You will need an internet connection to access all of the videos, worksheets, and bonuses.